1. Embodiment. You are an embodied intelligence. It is a mistake to think of mind and body as somehow separate. Our conscious experience and its awakening as a developing child is surely deeply rooted in our physical experience of the world as mediated through our senses. 2. Environmental continuity. Our experience of the world changes 'relatively' slowly. The word relative is important here since I mean relative to the rate at which our conscious experience updates itself. Of course we do experience the discontinuity of going to sleep then waking to the changed world of a new sunrise, but this is both deeply familiar and predictable. A word that encompasses both of these is situatedness. Our intelligence, and hence also conscious experience is inextricably situated in our bodies and in the world. Let me illustrate what this might mean with a thought experiment. Imagine a brain transplant. Your brain complete with its memories and life's experience, together with as much of your central nervous system as might be needed for it to function properly were to be transplanted into a different body. You would wake from the procedure into this new body. I strongly suspect that you would experience a profound and traumatic discontinuity of consciousness and, well, go mad. Indeed it's entirely possible that you simply couldn't (and perhaps mercifully) regain or experience any sort of consciousness at all. Why? Because the conditions for the emergence of consciousness and the illusion of its continuity have been irreversibly broken. However, if what I have said above is true, there's a flip side to the story that could have extraordinary consequences. If the continuity of consciousness is an illusion then, in principle at least, it might be possible to artificially perpetuate that illusion. Imagine that at some future time we have a sufficiently deep understanding of the human brain that we can scan its internal structures for memories, acquired skills, and all of those (at present dimly understood) attributes that make you you. It's surely safe to assume that if we're able to decode a brain in this way, then we would also be able to scan the body structures (dynamics, musculature and deep wiring of the nervous system). It would then be a simple matter to scan, at or just before the point of death, and transfer those structures into a virtual avatar within a virtual world. The simulated brain structures would be 'wired' to the avatar's virtual body in exactly the same way as the real brain was wired to its real body, thus satisfying the requirement for embodiment. If the virtual world is also a high fidelity replica of the real world then we would also satisfy the second requirement, environmental continuity. I would argue that, under these circumstances, the illusion of the continuity of consciousness could be maintained. Thus, on dying you would awake (in e-heaven), almost as if nothing had happened. Except, of course, that you could be greeted by the avatars of your dead relatives. Even better, because e-heaven is just a virtual environment in the real-world, then you could just as easily be visited by your living friends and relatives. Could this be the retirement home of the far future? In this way human consciousness could, I believe, be immortal. Ok, I admit it. I have an Xbox 360. Of course I'm hopeless at playing video games, which is perhaps just as well because it means that I don't spend long playing (or wasting time, depending on your point of view). Just as long as it takes for me to get frustrated by how useless I am and give up. (But it's ok because my eldest son levels me up when he comes to stay;-). However, as a piece of hardware it's awesome. Liquid cooled, 3 processors plus graphics processing unit. As someone who worked with the very first 8-bit microprocessors over 30 years ago (see my post By, you were lucky...) and with pretty much every generation since, I ought to be inured to the now expected doubling of performance roughly every two years (Moore's Law). But I'm not. I still easily get awestruck by next generation hardware and its capability. I'm equally impressed by the Xbox 360's operating system, its so called 'blade' interface is intuitive and a pleasure to use. 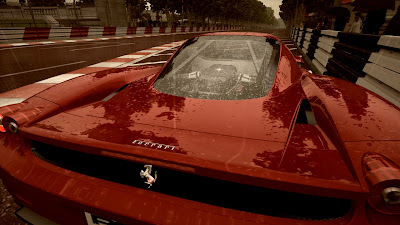 Of course this blog is really just an excuse for me to post a screen capture from the stunning Project Gotham Racing 4 of me driving (in my dreams) an Enzo Ferrari down The Mall, in the rain. Had a remarkable couple of days last week. Walking with Robots (WWR), the Royal Academy of Engineering (RAE) and the London Engineering Project jointly ran a pilot Young Peoples' Visions Conference. The aim of the 2 day event was to give an opportunity for around 20 young adults (age 16-18) to "explore visions of their future and the part robots will play" in that future. For me the event was important because it takes Walking with Robots into a new form of dialogue. At WWR events and activities I have been privileged to engage with many children, teenagers and adults, over the past year and I increasingly have a sense that our children, in particular, believe that the future is nothing to do with them. That technology is something that happens, or is imposed from outside and that they are merely passive consumers or targets for that technology. In this conference we really tried to change that view. It was wonderful to see the group change from - at the beginning - seeing this as 2 days out of college to - in the end - all being deeply engaged in the dialogue. I got a real sense of them feeling empowered and that their considered opinions are important - not least because those opinions will be published by the RAE and send to policymakers. In other words that they do have a say in their own technological futures. A day off sick with a head cold and painful sinuses had one consolation. I had a little time this afternoon to install Leopard - the new version of Mac OS X (which interestingly arrived this morning before it had been officially launched at 6.00pm this evening). How did the installation go? Well I'm happy to report that it was remarkable for being unremarkable. Just two minor comments: firstly, there was a very long pause (5 minutes perhaps) at the start of the install process proper, when the time remaining said 'calculating' and there was no apparent hard disk or DVD activity - I was beginning to have doubts about whether all was ok before the process sprang into life again (note to Apple: any kind of long and worrying pause like this really should still have some sort of progress indicator no matter how simple). Secondly, the time remaining calculation appeared to have difficulty making its mind up. Initially it said something over three and a half hours and then revised its estimate downwards over the next 30 minutes or so. In the end it took about an hour and a half from start to finish, and that included a long time for install disk verification. What else? Well the ability to instantly search and then - again with almost no delay - view the search results with 'cover flow' and the use 'quick look' to review what you find in more detail is terrific. The way that quick look opens everything from powerpoint presentations to movies and allows you to skip through the files with the left and right arrow keys but also scroll up and down individual files is just great. For the first time in 33 years of using computers I really think I don't need to remember filenames anymore. Given that this is still a good old fashioned traditional Unix file system underneath, Leopard is probably as close as you can get to feeling like an associative 'contents addressable' file system. *Footnote: I returned to Mac earlier this year after a 20 year separation. The first computers at APD (that we didn't design and build ourselves) were 128K Macs in 1985. Lovely machines with a proper windows OS (while the PC was still running DOS) that were used from everything from word processing and accounts to technical drawing. The projected ubiquity of personal companion robots raises a range of interesting but also troubling questions. There can be little doubt that an effective digital companion, whether embodied or not, will need to be both sensitive to the emotional state of its human partner and be able to respond sensitively. It will, in other words, need artificial empathy - such a digital companion would (need to) behave as if it has feelings. One current project at the Bristol Robotics Laboratory is developing such a robot, which will of course need some theory of mind if it is to respond appropriately. Robots with feelings takes us into new territory in human-machine interaction. We are of course used to temperamental machinery and many of us are machine junkies. We are addicted to our cars and dishwashers, our mobile phones and iPods. But what worries me about a machine with feelings (and frankly it doesn’t matter whether it really has feelings or not) is how it will change the way humans feel about the machine. Human beings will develop genuine emotional attachments to companion bots. Recall Weizenbaum’s secretary’s sensitivity about her private conversation with ELIZA - arguably the worlds first chat-bot in the 1960s. For more recent evidence look no further than the AIBO pet owners clubs. Here is a true story from one such club to illustrate how blurred the line between pet and robot has already become. One AIBO owner complained that her robot pet kept waking her at night with its barking. She would “jump out of bed and try to calm the robo-pet, stroking its smooth metallic-gray back to ease it back to sleep”. She was saved from “going crazy” when it was suggested that she switch the dog off at night to prevent its barking. It is inevitable that people will develop emotional attachments, even dependencies, on companion bots. This, of course, has consequences. But what interests me is if the bots acquire a shared cultural experience. Another BRL project called ‘the emergence of artificial culture in robot societies’ is investigating this possibility. Consider this scenario. Your home has a number of companion bots. Some may be embodied, others not. It is inevitable that they will be connected, networked via your home wireless LAN, and thus able to chat with each other at the speed of light. This will of course bring some benefits - the companion bots will be able to alert each other to your needs: “she’s home”, or “he needs help with getting out of the bath”. But what if your bots start talking about you? Herein lies the problem that I wish to discuss. The bots shared culture will be quintessentially alien, in effect an exo-culture (and I don’t mean that to imply sinister). Bot culture could well be inscrutable to humans, which means that when bots start gossiping with each other about you, you will have absolutely no idea what they’re talking about because - unlike them - you have no theory of mind for your digital companions. This is a short 'position statement' prepared for e-horizons forum Artificial Companions in Society: Perspectives on the Present and Future, 25th and 26th October, Oxford Internet Institute. One of the great pleasures of giving public lectures is the questions that come from the audience, and my talk last week to the Bath U3A group was no different. A great question (and one I've been challenged with before) was "could a robot have feelings - emotions like fear, sadness or love?" My questioner (and I guess most people) would be hoping for a comforting answer: No, only people and maybe some animals (your dog) can have feelings. In one sense that answer would be correct, because if we define feelings simply and subjectively as 'the feelings we experience when we are afraid, sad, or in love', such a definition would make those emotions uniquely human and something robots could not have by definition. For the sake of argument let's get over that by asking a slightly different question: could a robot have artificial emotions that - in some way - are an analogue of human feelings. At this point I would normally say to my questioner, well, yes, I can conceive of a robot that behaves as if it is experiencing emotions. A humanoid robot, in other words, that acts is if it were afraid, or sad. The better the techno logy, then the more convincing and subtle would the (artificial) body language be. Actually we don't have to try very hard to imagine such a robot - colleagues in the lab are working on robot (heads) with artificial empathy. Here a picture. At this point my questioner says "ah, but that robot doesn't really have feelings. It's just pretending to have feelings". True! But don't human beings do that all the time. Isn't it the case, in fact, that we value the ability to be able to pretend to express feelings very highly, providing it's the honest deception of the actor's trade? We also value people who can make us feel in different ways: musicians, artists, poets or storytellers. Ok, I admit I'm being a little tricky here, but the point I'm trying to make is that humans can be very good at pretending to have feelings or at deceiving others into having feelings, and some (me included) have a hard time telling the difference. Back to robots though. Yes, a robot that is programmed to behave as if it has feelings cannot, I grant, be said to actually have feelings. At best that robot is a good actor. This might seem to be the end of the issue but it's not, because the possibility of a robot that is very good at behaving as if it has feelings raises some pretty interesting issues. Why? Because in human robot interaction such a robot could have quite some power over the human. What interests me here is how such a robot would make humans feel towards it. Could a human, for instance, fall in love with an deeply (albeit artificially) empathic robot? I suspect the answer is yes. This is a subject I'll return to in future blogs: not only the social implications of robots with artificial feelings, but also the question of whether robots could be designed that really do have feelings. In Daniel Dennett's remarkable book "Darwin's Dangerous Idea" he describes the Tower of Generate-and-Test; a brilliant conceptual model for the evolution of intelligence that has become known as Dennett's Tower. I propose here another storey to the Tower, for what I want to call Walterian Creatures, after the pioneering neurophysiologist W. Grey Walter, inventor of the world's first electro-mechanical autonomous mobile robot. Gregorian creatures are tool makers including - importantly - mind tools like language, which means that individuals no longer have to generate and test all possible hypotheses since others have done so already and can pass on that knowledge. Gregorian creatures (after Richard Gregory) are tool makers, of both physical tools (like scissors) and mind-tools (like language and mathematics), and Dennett suggests that these tools are 'intelligence amplifiers'. Certainly they give Gregorian creatures a significant advantage over merely Popperian creatures, because they have the benefit of the shared experience of others, expressed either through using the tools they have made or refined or, more directly, through their knowledge or instructions as spoken or written. Arguably the most powerful intelligence amplifier so far created by one particular species of Gregorian-Scientific creature: man, is the computer, for with it we are able to simulate almost any reality we can imagine. Simulation is potent stuff, gedanken thought experiments are no longer doomed to remain flights of fancy and mathematical models need no longer remain dry abstractions. And one of the most remarkable kinds of computer simulation is of intelligence itself: Artificial Intelligence. What if the tools made by Gregorian creatures take on a life of their own and become, in a sense, independent of the tool-makers? Embodied AI (= Artificial Life) has this potential. Walterian creatures are, I propose, smart tools that have learned to think, grown up and left the toolbox. Think of future intelligent robots (far more capable than the crude prototypes we can currently build) that might co-exist with humans in an extraordinary and fulfilling symbiosis. Walterian creatures are, like Gregorians, able to share tools, knowledge and experience. They will be fully interconnected, so that any individual - subject only to the physical delays of the networking technology - can instantly seek information or resources from the shared Walterian artificial culture. However, unlike Gregorians, these individuals are capable of Lamarckian learning. Need a skill fast? If you’re a Walterian creature then, providing at least one other individual has already learned the skill and is either online or has previously uploaded that skill, then you simply download it. Walterian creatures would surely be profoundly different - and perhaps unimaginable by us merely Gregorian creatures - kinds of minds. Heard some great lectures yesterday evening at the Bath Royal Literary and Scientific Institute. John Sloboda gave a wonderful talk about the psychology of music, and in particular what makes the difference between a musical genius and the rest of us. He showed, with some pretty compelling evidence, that firstly you need to start learning an instrument very young, and secondly you need around 10 years of averaging 2 hours per day of practice - but not just any old practice, it has to be strongly supported and guided - before then starting composition. Are musical geniuses born or made? John offered the view that it's much more down to nurture than nature. He suggested that genetics may account for musical deficits (such as the very small number of people who are genuinely tone-deaf) but probably not musical genius. John told a story so fascinating that I want to recount it here. A US research team ran some IQ tests on a group of adults, one group immediately after listening to Mozart, the other (control) group without. The Mozart group showed higher IQ scores than the control group. Now that's interesting enough, but it's what happened subsequently and outside the research lab, that is really quite shocking. John recounted that a journalist reported this finding as "The Mozart Effect" and parents anxious to improve their youngsters' IQs started playing them Mozart, schools introduced the same practice, and in some US districts this became a requirement of the education authority. Pop-psych books were published and money was made. Google the Mozart effect and you'll see what I mean. But does it work? No. John explained that the original study was done on adults and subsequent work has shown that the same effect isn't apparent in children, and even on adults the IQ raising effect wears off after 10 minutes or so. But that's the power of a great meme. The idea is so attractive that as soon as it catches hold the truth behind the idea becomes irrelevant. And of course Mozart already has almost mythical super-genius status, so the Mozart effect meme was already riding on a winner. Someone asked John if the same would have happened if the original study had used another composer's music. "Almost certainly not", he replied, "the Couperin effect, doesn't have anything like the same ring to it!" But the world is full of such memes. Some emerge from flaky science, others from a flawed interpretation of otherwise good science. A particular hobby horse of mine is "The Big Bang". Popular culture regards the Big Bang as an established fact. But it isn't. There are two competing theories for the origin of the Universe: one is the big bang theory, the other is the steady-state theory. The problem with the steady-state theory is that it's just dull. Where's the excitement in the idea that the Universe has always existed? Like the Mozart effect, the big bang theory feeds a need. Finite creatures that we are, we like the idea that the Universe has a birth and a death. And if you believe in God, even better. The steady-state theory is not good news for theists. Memes really are powerful magic. Last night's Horizon was promising: what might have happened if the asteroid that is generally agreed to have triggered the extinction event at the end of the cretaceous period 65 million years ago had missed? This should be good, I thought. Interesting to speculate about how dinosaurs might have continued to evolve. What forms might they have evolved into by now..? But the programme was spoiled by an unnecessary and scientifically dubious focus on the question "what would have happened if humans had co-evolved along with dinosaurs?". Given the extraordinary success of the dinosaurs in exploiting ecological niches (as the programme pointed out) the likelihood that mammals would have evolved very much beyond the rodent-like animals (like Repenomamus) that managed to just about co-exist with dinosaurs must be vanishingly small. (Clutching at straws perhaps) the programme suggested that the tree-tops might have provided a dinosaur-free niche in which primates might have evolved, but failed to address the question of why dinosaurs would not have also moved into the same eco-space, especially with fresh mammalian meat to tempt them. But for me the programme makers lost it completely with the suggestion that intelligent humanoid dinosaurs might have co-evolved with humans. Now I love thought experiments, but the idea that homo dinosauroid would now be peacefully sharing our 21st C. cafe culture is, frankly, insulting to dinosaurs. We were shown a rather meek and frightened looking specimen (well you would be too with no clothes on) - clearly 21st C. homo d. needs to get down to the gym. Now I have no problem at all with the idea that dinosaur evolution, if it had not been rudely interrupted by the Chicxulub asteroid, might have resulted in highly intelligent dinosaurs, language, culture and so on (especially given emerging evidence for gregarious behaviour in dinosaur groups). If the asteroid had missed, and (against the odds) primates and hominids had evolved alongside intelligent dinosaurs, the suggestion that the two lineages would have somehow co-evolved into a peaceful vision of Dinotopia is, well, just unbelievable*. Much more likely is that the dinosaurs would have been subject to another and equally lethal extinction event. Man. *I say this with the greatest respect for the wonderful books of James Gurney. "When I were a lad, we only had 4K bytes of RAM and a hex keypad"
"Hex keypad! By, you were lucky. We only 'ad 1K of memory and had to key in t'boot loader by 'and in noughts and ones before we could even start work". "Well you were lucky. We were so poor we could only afford noughts..." and so on. But the truth is (and I realise how perilously close I am to becoming a grumpy old man parody here) that my fellow graduate students and I really did have to start from scratch and make all of our own development tools. 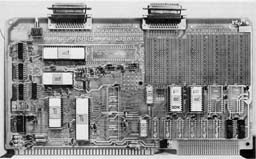 I recall that we first had to write a cross-assembler, in Algol-68, on the university mainframe: an ICL 1904S. We took advantage of the fact that the mainframe was accessed by electro-mechanical 'teletypes' which were fitted, as standard, with paper-tape punches. We got hold of a paper tape reader and interfaced it to the Intel 8080 development board (designing by hand the necessary interface electronics and device driver code - remember this is long before 'plug and play'). 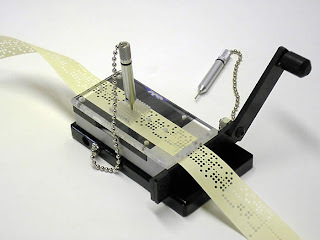 Then we were able to write symbolic 8080 assembler on the mainframe, generate 8080 machine code on paper tape, and load that directly into the 8080 development board to test it. Of course the edit test cycle was pretty long, and not helped by the fact that our lab was two floors from the mainframe terminals, so to speed things up we invested in a special device that allowed us to directly 'edit' the paper tape. The device allowed us to make extra holes and cover over - with a special kind of sticky tape - unwanted holes. Here's a picture of this marvellous device. So, to anyone out there who grumbles about their software development tools I have only one thing to say. "You're lucky you are. When I were a lad..."
At a little over 5 cm tall the e-pucks are remarkable little robots. 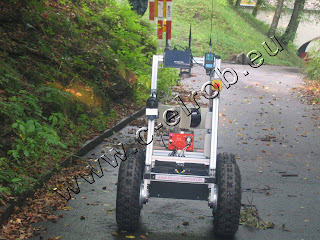 Here is a picture from the web pages of supplier and all round good people at Cyberbotics. Our e-pucks got their first outing at the Brighton Science Festival's Big Science Sunday, on February 18th (and let me pay tribute to festival organiser Richard). A small pack of 4 or 5 e-pucks in a table top arena proved to be a compelling attraction for kids of all ages. A great talking point that allowed us to pontificate about everything from ants and swarm intelligence to the future of robots in society. Here is a picture with my colleague Claire Rocks in mid-demonstration showing part of the arena with two of the e-pucks contrasting with the old Linuxbot on the left. It's amazing to think that the Linuxbot was state-of-the-art technology just 10 years ago. 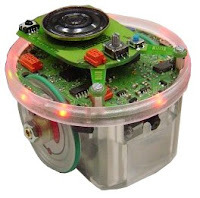 The e-pucks, with sound (microphones and speaker), vision (camera and LEDs), bluetooth radio, proximity sensors and accelerometer are astonishingly sensor-rich compared with the venerable Linuxbot and its generation. Now the small size of the e-puck can be deceptive. A week or so before the Brighton gig I thought I would try and code up some new swarm behaviours for the robots. "Little robot - how hard can it be", I thought to myself as I sat down to an evening's light coding. Boy was I mistaken. Within the e-puck's densely packed motherboard is a complex system which belies its small size. The Microchip dsPIC microcontroller at the heart of the e-puck has come a long way from the reduced-instruction-set and reduced-everything-else 8 bit PIC I programmed with a few dozen lines of assembler for our early Bismark robot 10 years ago. And in the e-puck the microcontroller is surrounded by some pretty complex sub-systems, such as the sound i/o codec, the camera and the bluetooth wireless. It's a complex system of systems. So, suitably humbled, I shall have to take some time to learn to program the e-puck*. Just goes to show that with robots too, appearances can be deceptive. *Fortunately, and with remarkable generosity, the e-puck's designers have released the whole of the e-puck design - hardware and software - under an open source licence. So there are lots of function libraries and example programs to be explored. And I should have mentioned that, in addition to public engagement, we're also evaluating the e-pucks as possible robots for our new Artificial Culture project. More blogs about this in due course. Almost exactly a year ago I wrote about wild predictions of human level AI. Another prediction that has caught the attention of the general press is about robot rights. See for instance this piece in the otherwise sensible Financial Times: uk report says robots will have rights, or the BBC technology news here, and elsewhere. Robo-rights: Utopian dream or rise of the machines? The report, by Outsights - Ipsos MORI, was part of the UK government's strategic horizon scanning exercise and is pretty brief at a little over 700 words. In a nutshell, the report says that if robots gain artificial intelligence then calls may be made for them to be granted human rights. The report doesn't make it clear whether such calls would be made by humans on robots' behalf, or by the robots themselves (although the only link given is to the American Society for Prevention of Cruelty to Robots, which seems to imply the former). The likelihood of this is rated 1 out of 3 stars (33%..? ), and timescale 21-50+ years. The report, which is clearly written from a legal perspective (nothing wrong with that), goes on to make some frankly surreal speculations about robots voting, becoming tax payers or enjoying social benefits like housing or health-care. Hang on, is this really a UK government commissioned report, or a script from Futurama..? I'm suprised it didn't go on to warn of loutish robots subject to ASBOs. Do I think robots will have (human) rights within 20-50 years? No, I do not. Or to put it another way, I think the likelihood is so small as to be negligible. Why? Because the technical challenges of moving from insect-level robot intelligence, which is more or less where we are now, to human-level intelligence are so great. Do I think robots will ever have rights? Well, perhaps. In principle I don't see why not. Imagine sentient robots, able to fully engage in discourse with humans, on art, philosophy, mathematics; robots able to empathise or express opinions; robots with hopes, or dreams. Think of Data from Star Trek. It is possible to imagine robots smart, eloquent and persuasive enough to be able to argue their case but, even so, there is absolutely no reason to suppose that robot emancipation would be rapid, or straightforward. After all, even though the rights of man as now generally understood were established over 200 years ago, human rights are still by no means universally respected or upheld. Why should it be any easier for robots?